This is a long post reviewing my goals and achievements for 2006, please keep in mind I intended to take my long service leave when I set my goals, so I think I may have achieved more if I had taken my holidays (ha ha ha!! ROTFL). When all’s said and done, I didn’t do too badly, I just didn’t do any of the things I set out to do! Butterfly in my Garden – Elegant Stitch. On average a finish every two weeks! Not too bad considering I didn’t get my 5 months leave. I used Pink to highlight my Essy’s friends / Elegant Stitch Breast Cancer fundraiser projects. Enchanted Mermaid (Mirabilia SAL group) – going for a finish here. Valentine’s Exchange – design selected, to be stitched in January. 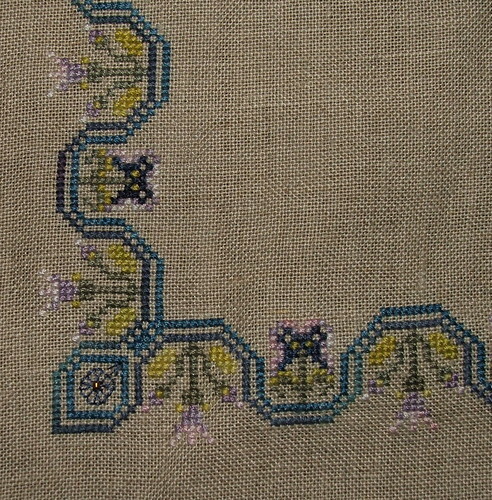 First up here is a photo of Persian Iris Garden, I am currently beading the centre and having some crowding issues, so instead of throwing it across the room (pointless but satisfying in a small way), I have decided to take a pic so you can see I have been working on this piece at long last. It’s very pretty on the black and I haven’t had too many problems adapting to using dark fabric. I remember when P.I.G started people did have problems with the beaded centre, so I am going to just have to have another go when I am a bit calmer. My last/first progress pic was taken in May! I unpicked the gold in the centre and re-did it yesterday morning and have since carried on. In happier news I have finished part I of of Sampler Mystery II! There is supposed to be a bead above each flower in the outer border but I will leave them off till the end of the project as I may still wish to use my Q-snaps (this project is bigger than my largest set!! Again I have included a corner pic and one of the entire thing. 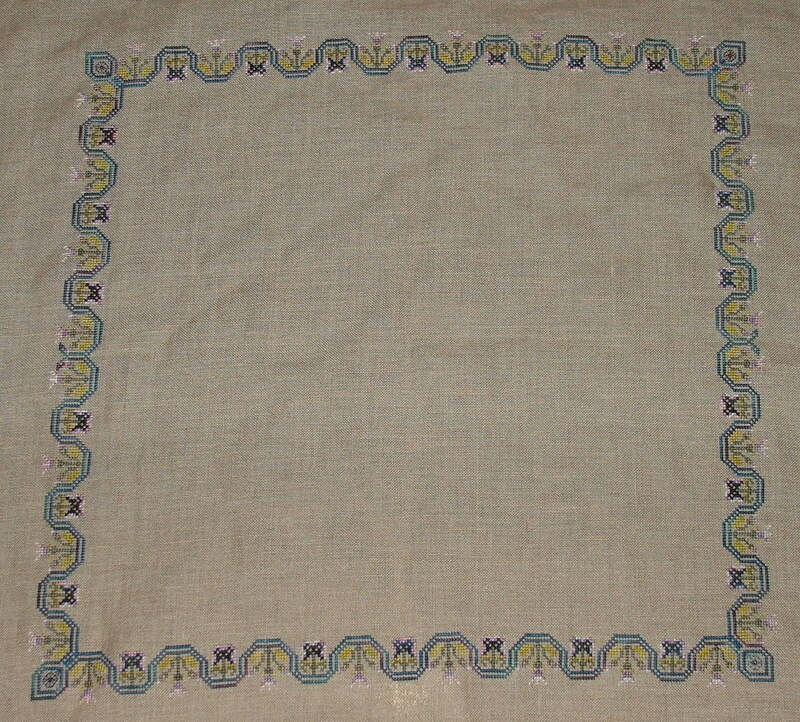 I laid the Sampler Mystery II fabric over the Persian Iris Garden Fabric and the size difference is negligible. I am starting to understand why I got a bit bogged down with these during the year! There is no progress to report on L is for Librarian, I am still afraid of the ribbon work (I’ll get over it shortly and it will move on). I’ve got the leprechaun to aim for! I have seen the new Mirabilia, Lady of the Mist and of course I love her. Apart from the Christmas tree, I have loved all her recent releases. I really ought to get back to working on my Mirabilia WIPs. So many beautiful designs – not enough time!